Teachers in Denver, Colorado are on the brink of going out on strike. Given last year's statewide demonstrations in Colorado, West Virginia, Arizona, and Kentucky, not to mention the recent teacher strike in Los Angeles, it might be tempting to think of Denver as just one more data point in a larger national trend of teacher activism. But Denver is different for a few reasons. First, unlike the rest of the contry, teacher salaries in Denver have been going up. Denver teacher salaries have risen 4.1 percent a year over the last five years, which is a faster growth rate than its overall per pupil spending (see data on page 27 here). The district is now proposing a further 10 percent raise, and the union is requesting a raise of 12.5 percent. Those are much larger numbers than in Los Angeles, for example, where the union ultimately agreed to a 6 percent raise phased in over two years. Second, as Rick Hess notes in an excellent piece for Forbes, the Denver debate is largely over a pay-for-performance program called ProComp that began in 2005. The district and union are not all that far apart on total spending, but the disagreement is largely about how that money is allocated and whether it should go toward base pay or incentives. Still, if I were a Denver teacher, I would be upset about the district's inability to control spiraling benefit costs. While Denver has seen revenue increases and has been able to translate a good portion of that into higher salaries, the increases to base salary pale in comparison to Denver's spending on benefits. To show what this looks like, I created the graph below using data from the U.S. Census Bureau. 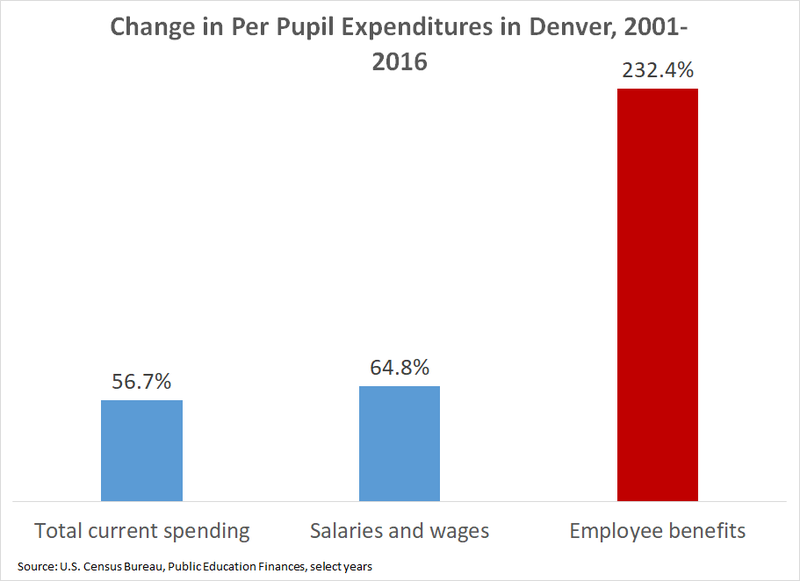 As the graph shows, from 2001 to 2016 Denver increased current spending per pupil by 57 percent, and it increased spending on salaries and wages by 65 percent, but its spending on employee benefits soared by 232 percent. That is, Denver's spending on employee benefits rose about four times faster than its spending on salaries and wages. Part of this is due to changes in health care costs, but the state pension plan is also a big factor. Mandatory contribution rates to the Colorado teacher pension plan doubled between 2001 and 2016, and they've continued to rise since then. In fact, in legislation passed late last spring, Colorado cut benefits for new hires and further increased employee and employer contribution rates. 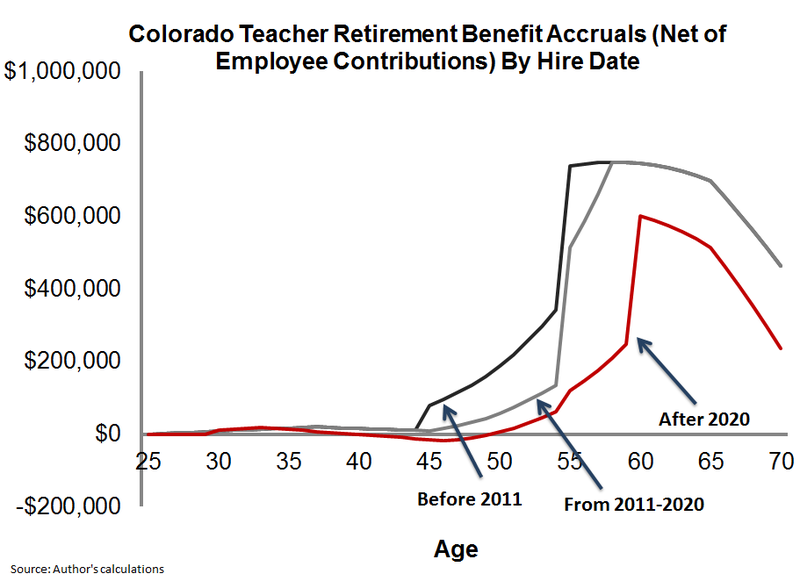 As I showed at the time, the net result is a dramatic decline in the value of Colorado teacher retirement benefits. The graph below shows the value of a teacher's pension under the Public Employees Retirement Association (Colorado PERA) depending on hire date. Workers hired before 2011 were placed in a back-loaded plan that required them to stay 20 or 30 years before qualifying for a decent benefit (represented by the solid black line). But the state offers worse benefits to those hired between 2011 and 2020 (the gray line), and it will offer even worse benefits to teachers hired after 2020 (the red line). To be clear, Denver as a school district has no control over the statewide pension plan. Those rules are set by the legislature and apply to all educators across the state. But Denver teachers are getting a particularly raw deal. Denver has a relatively mobile teacher population, meaning fewer of its teachers will stick around to reach the back-end peaks built into the state pension plan formulas. And given its fast-growing population, Denver will have a disproportionately large share of teachers hired into the new, worse benefit tiers. These benefit issues may not get the same attention as the fight over base salaries, but Denver residents should be concerned about how their school district's budget is being spent and how little control they have over this important part of it. Update: What is the Average Teacher Pension in my State? Roughly 90 percent of all teachers are enrolled in a pension fund. However, each fund has its own rules and set of conditions that determine the overall value of a retired teacher's annual benefit. Interested in data on the average teacher pension in your state? See the chart below for the latest data, updating an earlier post! The first column shows the “average pension” for newly retired teachers from the past ten years in each state. In the majority of states that don’t list the average benefit for newly retired members outright, these data are retrieved from states’ observations about retirees and beneficiaries added to the retirement plan’s rolls and about new benefit payments added to the rolls. These data are based on 2016 figures unless otherwise noted. Keep in mind that this method is not completely precise– these numbers also include beneficiaries added to the rolls because their spouses passed away, as well as potential increases in benefit payments due to inflation adjustments. The next column shows, among all newly retired teachers, what the median retiree earns. The third column shows the average pension for all current retirees and beneficiaries. Finally, the last column show the estimated percentage of new teachers who will actually receive a pension. The data come from each state's annual comprehensive financial report. In Maryland, for example, the “average pension” for new teachers is $24,409. But the median pension for new retirees is just $16,404, meaning half of all new retirees earn less than that amount. Moreover, 57 percent of new Maryland teachers are expected to leave the system before qualifying for a pension. (y) Indicates data based on 2017 figures. Of the teachers who do qualify for benefits, their benefits will vary widely. The statistical average, or mean, hides the fact that only a small percentage of incoming teachers will receive a full career pension at retirement, while many, many more get only a small amount. Also, teachers in 15 states aren't covered by Social Security; pensions in these states tend to be larger to make up for this fact. These amounts only tell us what a teacher earns at retirement—not what she contributed to her state or local system. The averages include many teachers who qualify for some pension, but those pensions may be worth less than the value of the teacher's own contributions. In many states, teacher pension plans have created newer, less generous retirement tiers for newly entering members. If you’re a new teacher and you live in a state with a tiered plan, your retirement plan could end up looking significantly more meagre than the numbers below. There's a Zora Neale Hurston quote that I love, because it's applicable to the human existence AND teacher pension blogs. Ready for it? "There are years that ask questions, and years that answer." If we're speaking of teacher pension blogs, 2018 was a year that asked. Four of our top five posts this year were questions. Teacher pension plans are inarguably complicated, so it's really no surprise that the most high traffic pieces published in 2018 were ones that shed light on a complex issue. Check them out below, plus one extra post highlighting our most asked question of all time. 1. Do Teachers Get Paid Over the Summer? One of the most common teacher salary questions is whether or not teachers get paid over the summer months. So, do they? Not the most satisfying of answers, but, it depends. Teacher payroll schedules vary district-to-district; some allow workers to spread their 10-month salary over 12 months, while others don’t give any paycheck during the summer months, requiring teachers to budget well, or in some cases, get a second job. 2. I'm a Public School Teacher. When Should I Retire? Although the decision about when to retire is a personal one involving many factors, in most states there is a very clear window during which a teacher can maximize his or her retirement wealth. As explained in this post, teachers can receive the most total money in pension benefits by following two rules: stay in the same pension plan for as many years as possible, and then retire at their state’s normal retirement age. 3. New Study: Three-Fourths of Massachusetts' Educators are Pension "Losers" A large group of Massachusetts teachers will receive pension benefits worth less than even their own contributions. How long they must stay depends on their age when they entered the profession. As shown in this post, a 25-year-old new teacher in Massachusetts won’t qualify for benefits worth more than her own contributions unless she stays more than 30 years. 4. Just How Expensive and Generous Are Teacher Pension Plans? Many people assume that an "expensive" retirement plans must obviously translate into generous benefits for workers, but that's not always true. If an employer contributes more money to a 401k plan, that money goes directly into workers' accounts. But that's not how most teacher pension plans work. This post digs into the nuance of teacher pension plan structure. 5. How Do You Calculate a Teacher Pension? Teacher pension systems can be quite complex. There are specific rules that vary state-to-state that affect any given teachers’ annual pension benefit after retirement. There are wider contexts to consider as well. This posts walks through a typical teacher pension formula, while also highlighting state-specific variables, like Social Security coverage and vesting periods. Finally, a New Year's bonus: our most viewed post, year-after-year, details the average teacher pension in each state. This year, my colleague Max Marchitello put in the work to update the post with the most recent data available. You can find it here. Barring a last-minute agreement, teachers in Los Angeles Unified School District (LAUSD) plan to go out on strike beginning Thursday. There are a number of factors driving the impasse, including fights over base salaries, class sizes, and charter schools, but one factor that's getting less attention is how much the district is spending on benefits for its employees. Consider the graph below, using data from the Census Bureau's Public Education Finances reports. 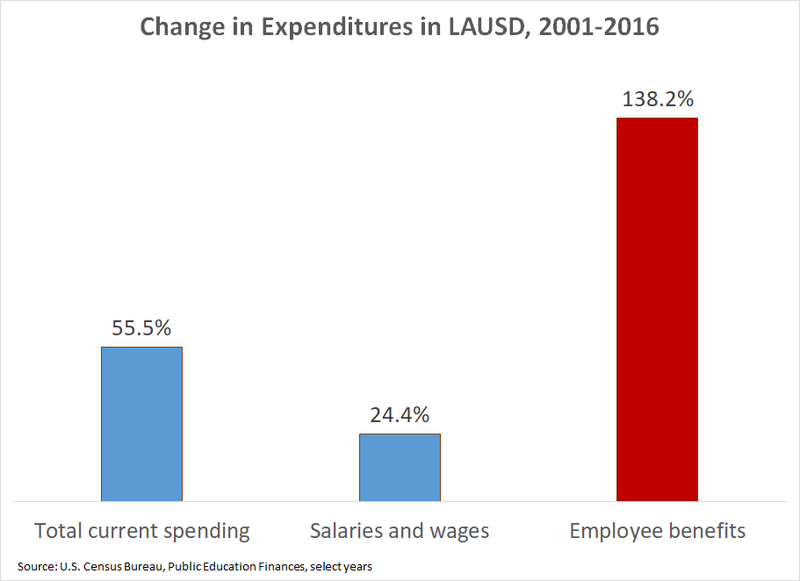 From 2001 to 2016, LAUSD increased overall spending by 55.5 percent, but its spending on salaries and wages increased just 24.4 percent. Meanwhile, employee benefit costs soared 138 percent. LAUSD is an extreme example, but this situation is playing out across the country. More and more of our nation's education spending is going toward benefit costs, due to significant increases in pension and healthcare costs. Another way to slice the same data is to look at the percentage of our education budgets that are being spent on the salaries and wages of teachers who work in instructional roles. Again, the national trend is not positive, and LAUSD is no exception. 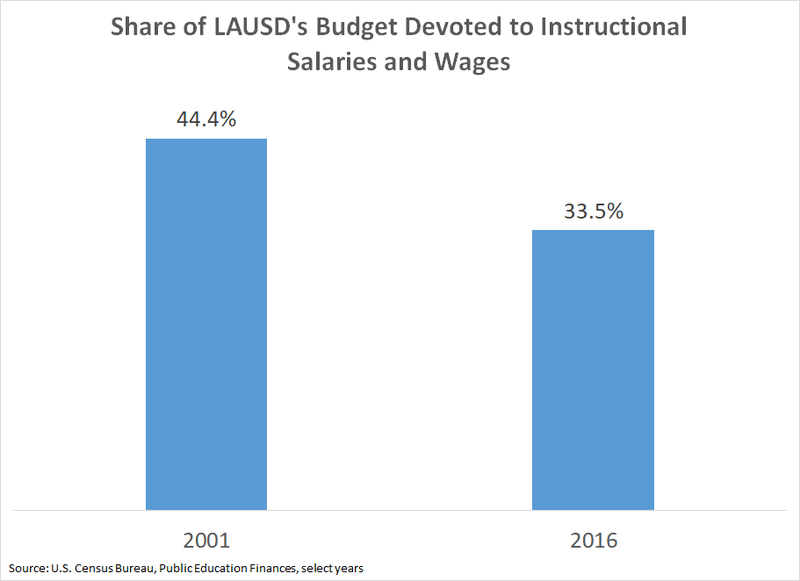 In 2001, L.A. devoted 44 percent of its budget to teacher salaries and wages; by 2016, that figure had fallen to 33.5 percent. As mentioned above, rising pension and healthcare costs are squeezing school districts' discretionary budgets and taking away dollars that could otherwise go toward hiring more teachers or paying them more money. These trends are still accelerating. In California, for example, the state has been ratcheting up employee contribution rates toward the state pension plans, CalSTRS and CalPERS, and rates will continue to rise through at least 2021. LAUSD has also created its own problems locally. At one point, the district promised free medical, dental, and vision coverage to all retirees with at least five years of service, and their spouses. It has gradually limited who is eligible for those benefits, but the district still doesn't require any retiree contributions toward those health care benefits. This year alone, LAUSD will spend $314 million on those benefits, which is the equivalent of more than $500 per pupil or $12,500 per teacher. Those costs are project to rise significantly over time. None of these trends are positive, and in fact most of the cost increases will be used to pay for the unfunded promises of the past, not for any new benefits for current or future workers. As you follow the news of the pending teacher strike this week, consider how L.A. got in this situation and whether any of the solutions on the table will make a dent in these long-term trends. What Can Education Reporters Learn From Teacher Pension Plans? School spending: How is education spending changing in my state, overall and across broad allocation categories? Pension contributions: How are contributions changing over time? Educator salaries: How much are educators paid, and how is that changing over time? How fast are salaries growing today versus in the past? Educator turnover rates: What are the turnover and retention rates for educators? Are there differences by gender, between different professions, or over time? For anyone having trouble finding these data for their state, please reach out to us at teacherpensions@bellwethereducation.org. 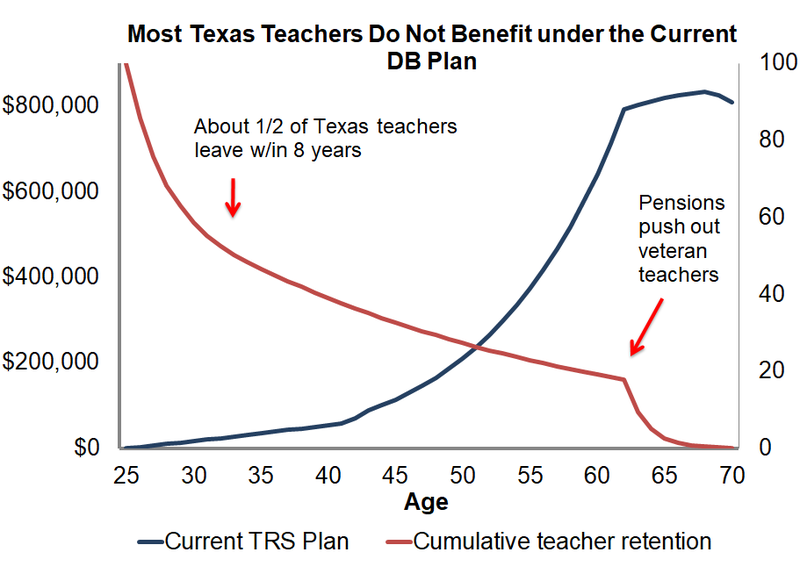 The Teachers’ Retirement System (TRS) of Texas is back-loaded, and it leaves the majority of its teachers without adequate retirement benefits. The TRS plan is one of the stingiest in the country. On average, Texas teachers receive less money toward retirement than many of their peers in the private sector. TRS benefits are getting worse. Due to rising costs, state legislators have slowly reduced benefits provided to new teachers, and teachers who enter Texas schools today are getting a much worse deal than their predecessors. Texas lets each individual school district decide whether they want to enroll their teachers in Social Security, creating a patchwork of coverage that is not good for teachers or employers. Texas has better options for public servants. In Texas, municipal and county workers are covered by retirement plans which do a better job of providing adequate retirement benefits to all workers. Each of these points deserves its own section, so I’ll break them down one by one. 1. The TRS system is back-loaded, and it leaves the majority of its teachers without adequate retirement benefits. This may sound fairly simple, but it’s complicated by the fact that the “Final Average Salary” number is calculated based on the years in which it was earned. That is, if our hypothetical teacher began her career at age 25 and served 15 years, her pension would be based on her salary at age 40. But, critically, she wouldn’t be able to collect her pension until age 65. By that time, inflation would have worn away the value of her pension significantly. This situation creates a mismatch between Texas’ retirement benefits and the behaviors of its teachers. The graph below shows this visually. The blue line represents how retirement benefits accumulate under the TRS plan for someone who begins teaching in Texas at age 25. As the graph shows, benefits grow slowly for the first 20 or 25 years, and they only begin growing faster as teachers close in on the normal retirement age. This is not an insignificant problem, because most teachers are gone well before those increases kick in. In the graph below, the red line shows the cumulative teacher retention rate in Texas, based on TRS’ own observations about employee behavior. The state estimates that about half of all new teachers will serve less than eight years, and two-thirds will serve less than 20 years. These teachers will need to find other ways to achieve a secure retirement beyond the TRS system. In sum, the TRS plan offers adequate benefits only to long-serving veteran teachers. As I’ll show in the last section, there are other models within Texas that could do a better job of protecting all teachers. But first, it’s important to understand the other ways the current TRS system is failing Texas teachers. 2. The TRS plan is one of the stingiest in the country. Most people hear the word “pension” and assume it must be good for workers. But that’s not always true, and Texas legislators have created a pension plan that is actually quite stingy, from an employer’s perspective. Texas teachers are required to personally contribute 7.7 percent of their salary, but their employers are only contributing about 2.4 percent of salary toward teacher retirement benefits (in actuarial terms, this is called the plan's "normal cost"). That’s less than a typical 401k in the private sector, where employers routinely chip in a 3, 4, or 5 percent match, and it's less than teacher retirement plans in other states. There are two reasons the numbers above may not match with the public’s perception of the TRS pension plan. One is that the 2.4 percent normal cost represents an average across the entire plan. Some long-serving Texas educators will eventually qualify for pensions that are worth far more than that, while most workers will receive far less. The TRS system includes a number of cross-subsidies, and it works especially well for workers, like principals and district superintendents, who earn higher salaries and have more longevity than classroom teachers, aides, or other school support staff. The second reason the TRS plan might seem more generous than it is is because Texas employers are contributing another 5.34 percent of teacher salaries to pay off unfunded liabilities (which actuaries refer to as the "amortization cost"). In total, Texas school districts are paying the same amount as employees, but much of the employer cost is going to pay down debt, not for actual employee benefits. This is not an insignificant sum, and it creates a disconnect between the amount employers are paying and the benefits that individual teachers and retirees receive. Worse, these unfunded liabilities have forced the state to cut benefits over time, such that new teachers starting out today are getting an even worse deal than their predecessors. 3. TRS benefits are getting worse. Like a number of other states, Texas has been forced to reduce benefits offered to new entrants in recent years. Texas has chosen to do this primarily by changing the normal retirement age, the point at which teachers are first eligible to start collecting unreduced retirement benefits. All workers are eligible to retire at age 65 with five years of service, but workers hired prior to 2007 could also retire at any age once the sum of their age and years of service passed 80 (commonly referred to as “the rule of 80”). Teachers hired between 2007 and 2014 had slightly less generous rules in that that the rule of 80 only applied to those age 60 or older. Texas again made changes for teachers hired after 2014. Now, teachers must wait until age 62 before qualifying for rule of 80 benefits. These changes have eroded TRS benefits and made them even more back-loaded. Like the first graph above, the graph below shows how retirement benefits accumulate for a teacher who enters her Texas service at age 25, but this time it shows how benefits accumulate based on the year she began working in Texas schools. As the graph shows, the shifts in the normal retirement age have dramatically changed how teacher retirement benefits accumulate. The darkest blue line represents the current TRS plan, compared to the lighter-colored lines, which represent the benefits offered to teachers hired in earlier years. As the graph shows, teachers hired prior to 2007 had much more generous benefits than those hired more recently. These changes have effectively made the TRS plan even more back-loaded, meaning fewer and fewer teachers have access to adequate retirement benefits. That’s not a good situation, and it puts more and more teachers at risk of an insecure retirement. This is particularly problematic due to the fact that most Texas teachers lack Social Security benefits. 4. Texas lets each individual school district decide whether they want to enroll their teachers in Social Security. Due to a historical quirk, Texas lets each school district decide whether they want to offer Social Security to their employees. 17 districts, including Austin and San Antonio, cover all their workers, and another 31 offer some employees coverage. Some regional service centers do as well, as do many Texas universities and community colleges. But that leaves some 1,200 Texas school districts that do not provide Social Security benefits to their workers. This messy hodgepodge is not good for workers or employers. From a worker’s perspective, they lose out on the nationally portable, progressive benefit structure that Social Security provides. That sort of protection is especially important given the back-loaded nature of the state-run TRS plan. Teachers may also not know at the time of being hired that their employer doesn’t offer Social Security benefits. They may take Social Security coverage for granted, and only find out later that they weren’t paying in and thus won’t receive benefits for those lost years. Employers bear the Social Security burden in other ways. Social Security coverage might be good for workers, but many people under-estimate its true value. An employer like San Antonio that enrolls teachers in Social Security might be doing right by its workers, but it might also be at a competitive disadvantage in attracting and retaining talent if workers don’t fully appreciate Social Security’s value. 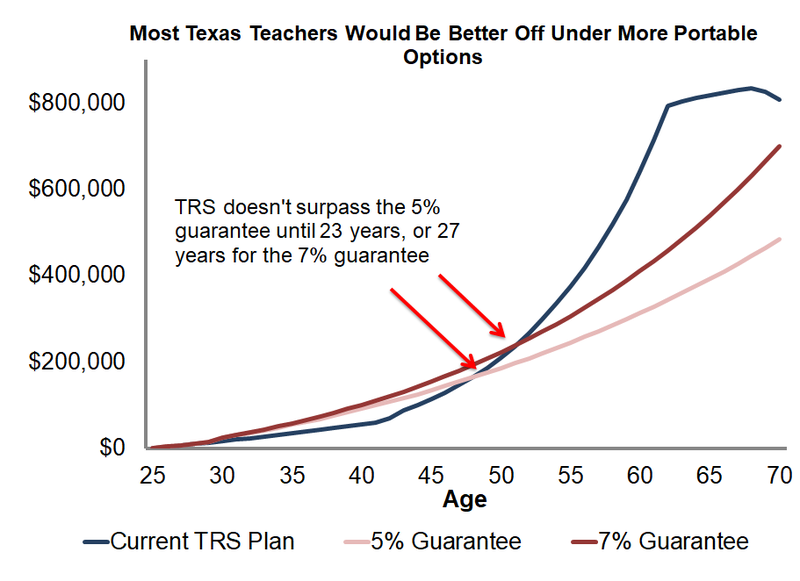 Ideally all teachers would have access to Social Security benefits, but Texas’ split Social Security coverage, and its back-loaded TRS plan, leaves Texas workers in a particularly precarious situation. 5. 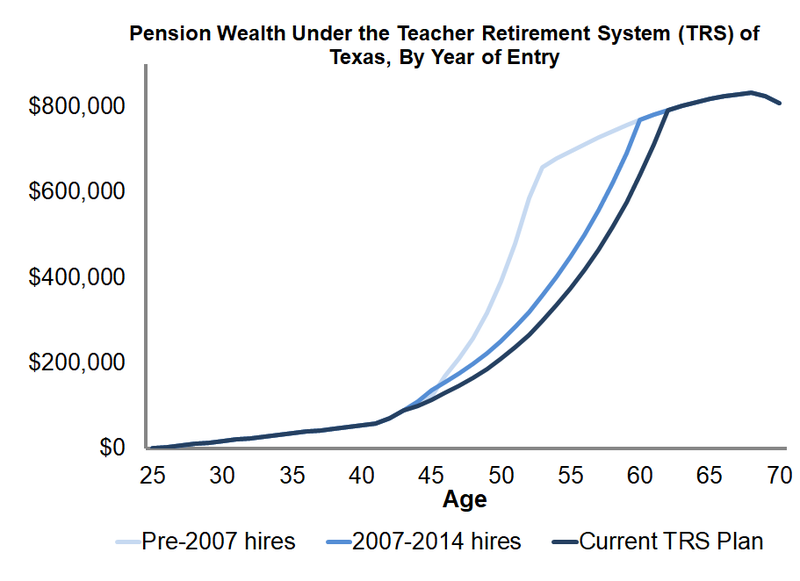 Texas should look within the state for better retirement options for teachers. Luckily, Texas already has two alternative models in place that balance the retirement security of workers with financial stability for employers. These plans already serve hundreds of thousands of public-sector workers in Texas, and they could be adapted for school districts and teachers. Both plans are legally considered to be defined benefit plans, but rather than using formulas based on years of service, they guarantee workers a certain rate of return. Those two plans, the Texas Municipal Retirement System (TMRS) and the Texas County & District Retirement System (TCDRS), are technically called defined benefit cash balance plans. They collectively serve about 350,000 city and county employees, including nurses, mechanics, road crew workers, sheriffs, attorneys, office workers, jailers and judges. Both plans are operated statewide, and they allow participating cities to select an employee contribution rate, an employer match, and a vesting period. In these types of guaranteed plans, the contributions go into an account in the worker's name. The plan invests the money and guarantees a rate of return, at least 5 percent under TMRS and 7 percent under TCDRS. This provides a more portable benefit with a steadier accumulation of assets than the TRS pension plan. Like TRS, both of these plans help employees when they’re ready to retire. When employees become eligible to retire, the money in their account is annuitized into regular monthly paychecks just like a pension. These paychecks allow for sustained monthly income, mirroring the benefits and stability of a traditional pension plan without the back-loaded accumulation under the current TRS pension plan. The graph below compares the TRS plan offered to new hires (the same dark blue as in the earlier graphs) against cost-neutral guaranteed plans like the ones currently operated by TMRS (a 5 percent guarantee, represented in pink) and TCDRS (a 7 percent guarantee, represented by the red line). For comparison’s sake, each plan is based on the assumption of a female teacher who begins her career at age 25. Due to the five-year vesting requirement assumed under all three plans, they look nearly identical for the first four years, but the guaranteed plans start looking better once the teacher vests and qualifies for the employer contributions. Because the TRS pension plan bases its formula on final average salaries that are frozen in time, it delivers benefits in a more back-loaded fashion. From a worker’s perspective, they would need to work 23 consecutive years before the TRS plan would be better than a simple 5 percent guarantee, or 27 consecutive years before the TRS benefits would exceed the 7 percent guarantee option. Although these “crossover” points would be shorter for teachers who begin their service at older ages, the majority of teachers would still be better off in the guaranteed rate plans due to high early-career turnover rates. The plans modeled here assume contributions are identical to the current TRS plan. Enrolling future teachers into one of these plans would not make the current TRS unfunded liability go away, but the guaranteed plans would help the state cap its debt costs at its current levels. In summary, Texas teachers currently lack secure, portable retirement benefits. Without action, the next generation of teachers are likely to have an even more precarious retirement situation. Luckily, Texas policymakers have good models to build on that already exist within the state. Adapting one of those models to the teacher workforce could help improve the state’s finances and ensure that all teachers are building sufficient retirement assets, no matter how long they work in Texas public schools.